Order your Rode NT2000 Vocal Condenser Microphone from AMS and enjoy 0% Interest Payment Plans, Free Shipping, Free Extended Warranty & 45 Day Money Back Guarantee. The World’s First Fully Variable Control Microphone! The RØDE NT2000 is the latest brainchild from Australian master microphone designer Peter Freedman. Never before has this much control and versatility been available in a superlative class large capsule recording microphone. You have totally variable polar pattern, filter and pad all located on the body of the microphone! The NT2000's state of the art surface-mount electronics combined with the new Australian designed and manufactured HF1 Capsule, provide extremely low self-noise (7 dBA) and a maximum SPL of 147 dB (157 dB with pad fully engaged) ensuring exceptional results and the ultimate in recording creativity. The NT2000 includes a hard case and a shockmount. I could go on to share the thousands of hours that went in to the research and development of this microphone, instead I am prepared to put my reputation on the line. 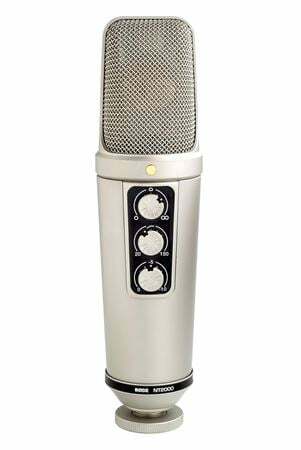 I am saying without fear of contradiction, the NT2000 is the best sounding and most versatile 1" FET studio microphone on the world market today, regardless of cost. Phone: 562-364-7400 Warranty: 10 Years! Lifetime Warranty on M1 Model! One of the best studio mics around!! !